"The Thames is liquid history", wrote some bloke I can't be bothered to google. When it comes to old waterways stories, we Brits tend to think we have the market cornered. Maybe, we think, just across the English Channel, the infinitely larger continental waterways leave behind one or two other interesting tales, and that's about it. But the fascinating 'Ghosts of DC' blog (offbeat historical tales of Washington DC) today reminds me that much of interest must lurk in the annals of American canal history. 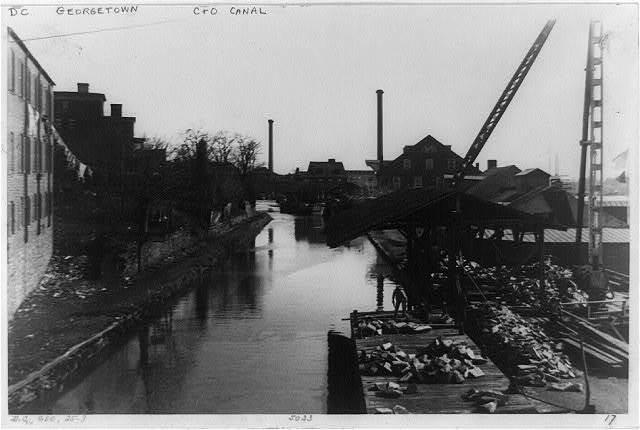 A does-what-it-says-on-the-tin post called 'Georgetown Canal Boatmen Brawl; Brutal Fight Ends in Murder', tells the 1886 tale of two boatmen on the Chesapeake and Ohio Canal, who fought over a wife. Says the blog post: "Here’s a little back story, and these always involve some intoxicant. Believe me, this gets a little crazy. George Seaman (aka, G.W. Simmons) was not a good dude." In a tall and dilapidated brick house facing the river, on Water street, above Thirty-third street, there occurred on Saturday night one of the most brutal and desperate fights between two canal-boat men which has for years startled the quiet community of West Washington, and which resulted yesterday in the death of John Bruebaker from the injuries he received from his adversary, George Seaman. Both are men of more than usual strength and distinguished by their brutality, but had always been friends until the frequent visits of Bruebaker’s wife to Seaman’s house led to an estrangement and the fight Saturday. It seems that while Bruebaker was sleeping off in his cabin a customary fit of intoxication on Saturday evening his wife determined to pay a visit to her friend, Mrs. Epps, who lives on the third floor of Seaman’s house, and while there was obliged to call for assistance in consequence of the sudden illness of her friend. Seaman responded instantly, and while the two were engaged in assisting the sick woman, the door was suddenly thrown open and Bruebaker staggered in in search of his wife. The moment he saw her his eyes, bloodshot from the effects of his recent debauch, lighted up with malignant fury, while the poor woman shrank frightened into a corner. “You are here again,” he said through his clinched teeth as he walked straight towards her and seized her by the shoulder. “This is the way you heed what I tell you,” and without paying the slightest attention to her entreaties, he struck her fiercely in the face. Before he could repeat the blow Seaman, who was still in the room, seized his arm and tore them apart. Then the two ruffians glared at each other and prepared for a struggle, but as they did so Mrs. Bruebaker rushed between, imploring Seaman not to strike her husband and saying that she was willing to stand the blows herself. Drunken Mr Bruebaker was the battle's loser, as the lede/standfirst tells us. But knowing the end doesn't take away from the fascination. And anyway, it wasn't quite the end. Seaman stood trial for manslaughter, but vanished into history. Why isn't journalism as creative as this nowadays? Well that is so cool. We were at this exact location last month on holiday in Washington DC. We of course had no idea of its dark history. If you use Google maps then street view where Wisconsin Ave crosses the C&O canal, you can see what this area looks like today.